With both indoor and outdoor facilities, Bridle Paths is able to operate year-round. Meet the wonderful horses that make up the Bridle Path herd! Learn more about our Equine-Assisted Psychotherapy and Therapeutic Riding programs. Contact us to purchase Bridle Paths merchandise! 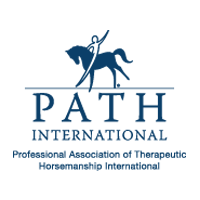 Bridle Paths is a nonprofit organization that offers strength, support, and healing to individuals and families through safe, effective, and high-quality equine-assisted activities and therapies. We provide therapeutic horseback riding instruction, equine-assisted learning, and equine-assisted psychotherapy services to individuals and families faced with physical, cognitive, psychological, and emotional needs. The program serves those with a wide variety of challenges and diagnoses, including attention deficit disorder, cognitive impairments, autism spectrum disorders, anxiety and depression, genetic problems, seizure disorders, brain injuries, post traumatic stress, and trauma. Our facility includes a 14-stall barn, indoor and outdoor arenas, a round pen, and a climate-controlled viewing area, and is easily accessible from Route 15, Route 7, and the Dulles Toll Road. The site has ample parking, a wheelchair-accessible barn, a mounting ramp, highly experienced and certified staff, and a group of committed and well-trained volunteers. "At Bridle Paths we celebrate our clients' abilities and possibilities, in partnership with horses." Through participation in programs at Bridle Paths, clients will recognize the myriad therapeutic benefits of the horse. In addition to the immediate benefit that riding affords for balance, strength, and coordination, clients benefit from the sensory, tactile, motor planning, and social and communication experiences that horses provide. Clients can enjoy improved health and mobility, enhanced self-confidence and self-esteem, and increased patience and reflection. Additionally, clients can cultivate positive leadership and problem-solving skills, regain trust and focus, and enjoy renewed hope for their futures through working with horses. Julie Fischer McCarter/Shoot Photo Inc. Volunteers, therapists, teachers, and patrons celebrate the cadence of movement, relationships, and caring that benefits all participants. We share the moments, big and small – a shared understanding between volunteer and rider, the optimism born of a newfound relationship with horses, the thrill of attaining a riding prize, or the satisfaction of sitting or walking unassisted – that make a real difference to individuals and to our community. "I checked in to this place which I visit monthly. It 's a fabulous place where you can see different gorgeous horses living in a friendly environment. Should you think of a place to see nature or enjoy your time, go to Bridle Paths to see how horses are full of humanity." Find us at 43247 Spinks Ferry Rd Leesburg, Virginia!